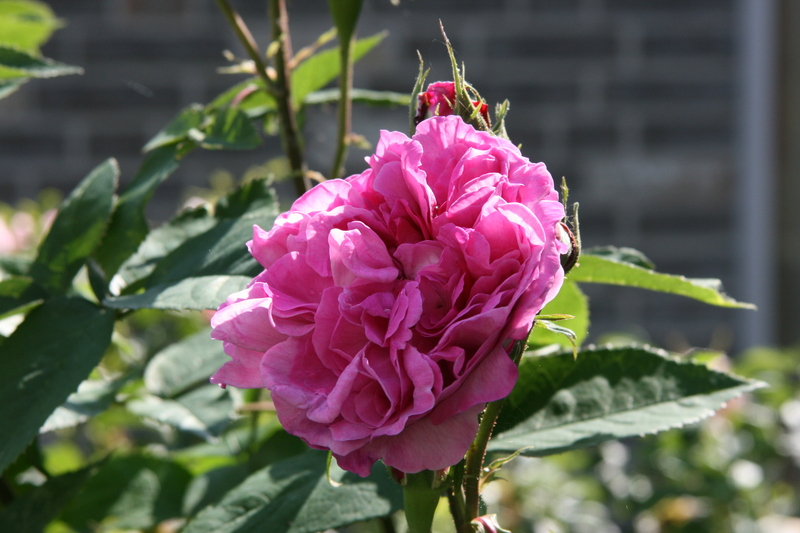 Of the hundreds of Hybrid Perpetuals that were once grown, there are now only a few left.The ancestor of ‘Reine des Violettes’ is a seedling of ‘Pope Pius IX. The flowers of ‘Reine des Violettes’ are about 10 cm tall and grow in dense clusters on short stems above a collar of dull gray-green leaves. The bush is large and graceful with very few thorns. The main flowering is in summer, with a repeat in autumn. Height of 4′ to 8′ (120 to 245 cm). Width of 3′ to 6′ (90 to 185 cm). I’ve planted this rose in 2010 in my (full sun) allotment, but I’ve also have this rose in my (semi) shaded garden at home. She does well in both places, but it seems to me that she likes the somewhat shaded place over the spot in the full sun. Therefore this is a good and beautiful rose for people who have a partially shaded garden, but who would like to grow roses.